Whether you’re building a new bathroom, or you’re looking to renovate the one you have and replace its fixtures, you have to find the best bathroom fixtures currently available. Not only will these fixtures look good, but they will also be durable and last a long time. Did you know that choosing between a high arc and a low arc faucet should be done according to your sink’s depth? 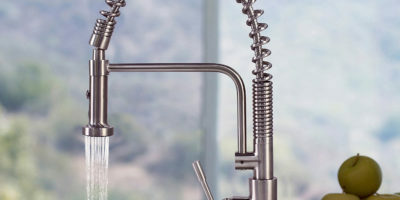 In the following article, we present the top 10 bathroom faucet reviews of 2019, and we reveal their pros and cons. Further, in the article, we explain how to choose the best bathroom faucets. There are a lot of features you should be aware of when you’re looking for a new faucet, and each of them can be important at some point. Read the following article to find out how to choose the right faucet model for your bathroom. It’s important when you’re building or redesigning a bathroom to use high-quality products. Not only will these products ensure your bathroom will look good, but they will also last longer. When it comes to high-quality bathroom faucets, there are a few companies that can compare themselves with Delta. Delta is one of the best faucet manufacturers in the world, and their products are top-notch. The Delta Cassidy 597LF is not different. This model comes in 5 different finishes so you won’t encounter any problems if you want it to match your other fixtures. The faucet has clean smooth lines that will complement your bathroom design, and it is designed for both three-hole and single-hole installations. Beautiful Design – This faucet’s design combines classical elements with modern lines. This combination not only looks great, but it’s also very easy to blend in both modern and classical styled bathrooms. 5 Finishes – The different finishes make it easier for you to match the faucet with your other fixtures. 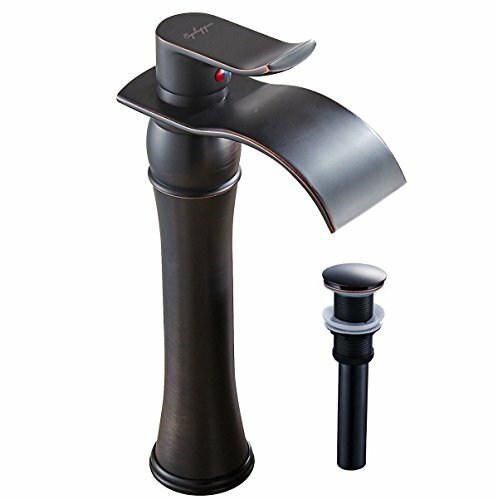 Bad Installation Guide – This faucet comes with a poor installation guide, and some people might encounter some problems during the installation. For example, you should install the faucet so the hot water runs when the handle is towards you, which the guide doesn’t even specify. 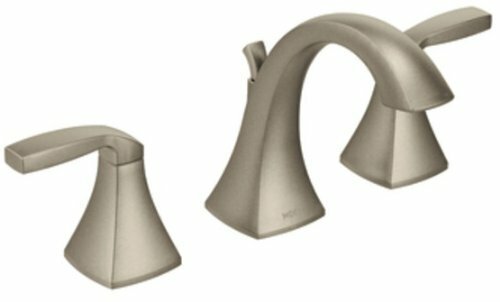 If you’re looking for a stylish two-handle bathroom faucet that’s not only nice looking but durable as well, you have to take a closer look at the Moen Kingsley T6125. This model comes in 4 different finishes, so you can surely find a model that will match with the rest of your fixtures. The Moen T6125 comes with a high arc spout that will provide more clearance for your hands, and it will make the faucet stand out in any decor. The antique design of the faucet will improve the look of your bathroom, and it will match perfectly with both modern and classical designs. This model is easy to install and you should be able to do it by yourself even if you don’t have a lot of experience with DIY projects. As a matter of fact, the installation manual is so easy to follow, we recommend this model to every DIY enthusiast, even to beginners. Great Instructions – The installation manual is easy to follow, so most people will be able to install the faucet by themselves. High-Quality Finishes – The finishes are high-quality and they won’t get scratched easily. Tightening Nut Is Difficult To Reach – The tightening nut can be difficult to reach, so you will have to be patient during the installation. Whether you’re an experienced contractor, or you just want to do a makeover on your bathroom, you have to admit that two-handled faucets improve the overall aspect of a bathroom. They look so good, they make the bathroom look better as well. The Hampton model produced by American Standard is a faucet that will become the centerpiece of your bathroom. With a polished chrome finish and a classic design, this faucet will make a perfect addition to most bathrooms, no matter their design. The faucet has a solid brass construction that increases its durability. The brass also makes the finish become part of the faucet, so it will withstand the daily wear and tear better than other models. Environmentally Friendly – This faucet was specially designed to save water, so using it will lower your water consumption, but it does it without lowering its performance. Easy Installation – The faucet is very easy to install, and most people will be able to install it without professional help. Aerator Makes The Water Drip – The aerator will make the water drip. It won’t make the water leak, but after you use the faucet some of the water will stop above the aerator. This water will drip out slowly. 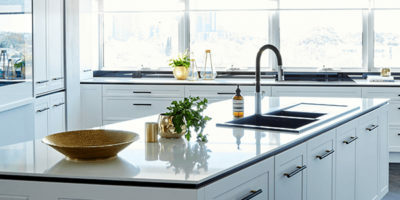 If you ask a professional contractor who’s been involved in the business for a long time for a high-quality faucet recommendation, chances are he or she will recommend a KOHLER product. 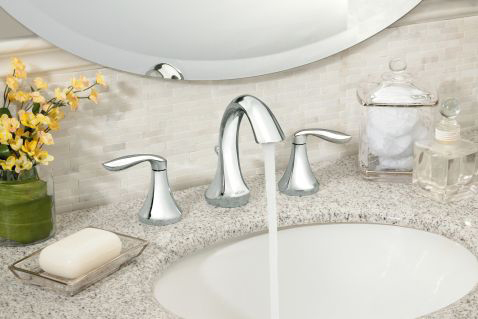 KOHLER faucets are world-renowned for their durability, and they also look great. The KOHLER Devonshire is a good example of the quality KOHLER provides. The two-handle faucet is pre-assembled on the valves for an easier installation, and it uses ceramic valves for an increased lifespan. 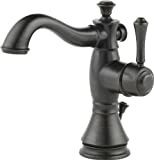 This faucet has a solid brass construction which provides it durability and reliability. All the finishes KOHLER uses are resistant to tarnishing and corrosion, so they will look as good as new for a very long time. Easy Installation – This model is easy to install, and most experienced DIY enthusiasts will be able to install it without even reading the instructions manual. Great Looking – The faucet is beautiful, and it will be a pleasure to use. Damaged Products – Several customers have complained that their products were damaged, even though the box they came in didn’t appear broken. This might indicate a problem in the manufacturer’s boxing and shipping department. When you’re looking for a modern looking bathroom faucet, you have to look for straight lines and a clean design. This is exactly what the Delta Dryden offers. With a modern take on a classic design, this bathroom faucet has a simple yet very sophisticated look. 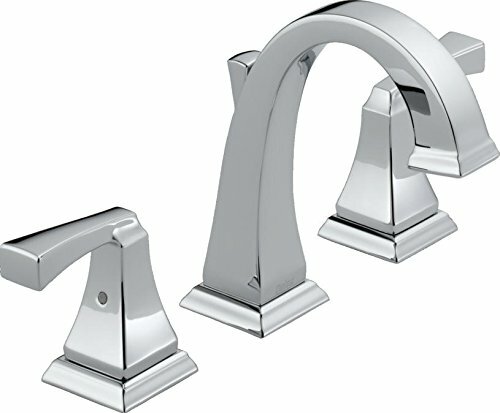 Not only does this two-handle faucet look good, but it’s also very durable as well. This model uses the DIAMOND Seal Technology to increase its durability and lifespan. This model is also environmentally friendly and it will help you save money. 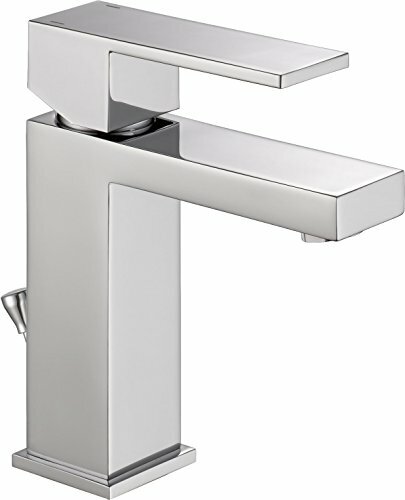 The faucet is WaterSense certified, so it will use 20% less water than other models, but deliver a similar performance. 5 Finishes – The Delta Dryden 3551LF comes in 5 different finishes. This makes it easier for you to match it with your existing fixtures. Easy Maintenance – You won’t have any problems maintaining the faucet. All the finishes are easy to clean, and you just have to wipe them with a towel to make them look as good as new. If you want to redecorate your bathroom, you have to start from scratch. The best thing is to start with the tiles, then change the shower or bathtub, the sink, and then look for the right fixtures. When it comes to finding the right bathroom faucet, things can become slightly difficult. Every faucet is designed to fit a certain style, so finding a modern one you can install in a traditional-styled bathroom can be hard. Luckily, you can choose the Voss faucet produced by Moen. This faucet combines elements from both traditional and modern styles, so it is very easy to use in both. It has a high arc that allows you more moving space, and it also features crisp edges that enhance its appearance. The two-handled faucet is environmentally friendly, and it’s very easy to install. Non-tarnish Finish – This model comes with a non-tarnish finish, so it will look as good as new for a long time. Good Installation Instructions – The faucet comes with easy to follow installation instructions, so you can install it yourself if you follow them. Valves Are Not Included – If you decide to buy this faucet, you will also have to buy a set of working parts because they are not included. Some people don’t want their bathrooms to be normal, to look like those of other people. They want to impress their family and guests with the unique design they create, and most often than not, they do just that. When you want to redecorate your bathroom so it will impress all your guests, you have to take a closer look at the Windemere faucet model produced by Delta. 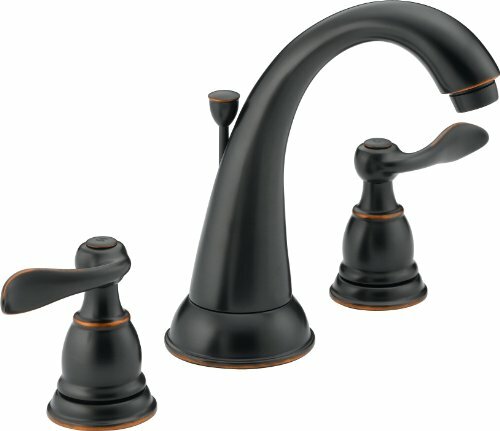 This faucet has a great design, and it comes with very stylish finishes. Not only does this product look very good, but being a Delta product, it’s also very durable and efficient. The faucet is environmentally friendly, and it will use 20% less water than other models, without lowering its performance. Great Finish – The oil bronze finish of this faucet looks amazing. Installing this unit in a bathroom will certainly make it the centerpiece, no matter what design the bathroom has. Easy To Install – The faucet is not difficult to install, and most people will be able to do it themselves without encountering any problems. Installation Manual Could Be Better – The installation manual is easy to follow, but it fails to mention how to connect the hoses. Most experienced contractors will tell you that it’s not the living rooms or bedrooms that sell houses, it’s the kitchens and bathrooms more often. It’s not that bedrooms and living rooms are not important – they are, but everyone wants to make those spaces their own, so they are usually the first ones modified when new owners move in. Bathrooms and kitchens, however, are usually kept the same. The Moen Eva is a faucet model that will pass the test of time. With nice clean edges and curved lines, this model is fashionable today, and it will be for years to come. The faucet uses two lever handles to make water adjustment easy, and the aerated stream is capable of delivering up to 1.2 gallons of water per minute. Elegant – This model finds the right combination of straight and curved lines, and the overall look is elegant and subtle. The faucet looks very good, and it will stay fashionable for a long time. High-Quality Finish – The faucet has a high-quality finish. The finish is very durable, and it will withstand the usual wear and tear without scratching. Handles Can Get Stuck – Some customers have complained that the faucet’s handles have gotten stuck after some use. Some of them have been using the faucet for only two years when this happened. It’s very important to find the best fixtures available and use them when you decide to remodel your home. You might not want to sell right now, but you might eventually, so why bother making changes again? The Delta 567LF-PP is one of the most popular models currently available, and it has a simple yet elegant design that will be fashionable for a long time. The faucet has a single handle, so you will be able to adjust the water’s temperature quickly. This model is perfect for modern bathrooms, and the straight lines it uses makes it blend in beautifully with any design you might have in mind. Environmentally Friendly – This faucet is considered environmentally friendly because it uses 20% less water than regular models. Despite this fact, the lower water usage doesn’t affect its water flow or efficiency. Eye-Catching – Despite its simple design, this faucet is very eye-catching. It will look great with most sinks, either modern or traditional, and it will work for years on end. Spots Are Easy To See – The faucet’s finishing makes any spots easy to see. This might be a disadvantage for people who don’t like high maintenance products. Most people believe that only the design of their living room and kitchen will impress their guests, but that’s far from the truth. Well, it’s true that these rooms are the ones most of your guests notice as they come to your home, but they will also go to the bathroom, so why not use this room to impress them as well? When it comes to building an impressive bathroom, choosing the right fixtures is very important. If you want to buy an impressive faucet, you have to take a closer look at Aquafaucet’s Waterfall model. 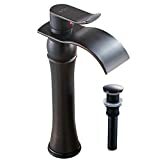 This faucet uses a single handle for water temperature adjustment, and it comes in an oil rubbed bronze finish. The faucet looks amazing, and it benefits from a lifetime breakage warranty. Waterfall Feature – This faucet comes with a waterfall feature. This feature looks good, and it’s also a cool way to lower your water usage. The water is produced in a wider pattern, so you might use less when washing your hands. No Instructions – Despite the fact that this faucet is easy to install by someone with previous experience, it doesn’t come with installations instructions. Finding the right bathroom faucet model might sometimes be more difficult than you might think. A faucet doesn’t only have to be functional, it also has to look good. But not all the faucets can be used in every bathroom. Depending on your bathroom’s style and design, you might want to choose only some faucet models. We created this short guide to help you discover the best bathroom faucet for your home. Here’s what you should take into account before buying a certain model. One of the first things you should take into account is the style and design of the faucet. Classical Design – When we say classical design, we’re not referring to the old swan neck bathroom faucet your grandmother had in her home when you were little. We’re referring to the models that use modern technologies but look just like the faucets people used at the beginning of the 19th and 20th. 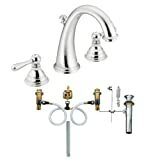 These faucets are best suited for traditional styled bathrooms, and they are usually the centerpiece of the room. If the classical faucet is not the centerpiece, it usually enhances the centerpiece’s aspect, be it a sink, a mirror, or just the antique tiles you have on your walls. The faucets can have one or two handles, but most of them use one, as did the original models decades ago. When you decide on buying a classical faucet, make sure you install it on a classical looking sink. Modern Design – Faucets that have a modern design are the perfect fit for modern bathrooms. They usually have straight or curved lines, and they can have one or two handles. 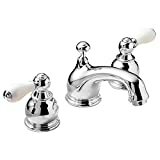 These faucets can be a centerpiece of the bathroom, but they are usually just augmenting another piece, like a sink or a mirror. When you decide on buying a modern looking faucet, make sure you install it on a sink that also has straight lines and a modern look. Hybrid Design – Some faucets actually have a hybrid design. They can be used in both traditional and modern bathrooms. 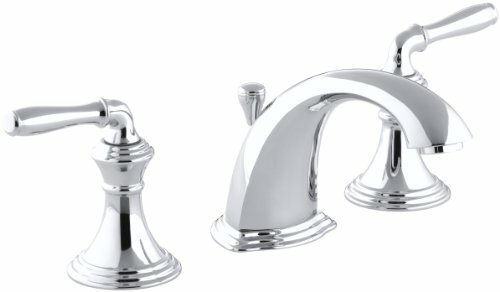 It’s not uncommon for these faucets to resemble a classical faucet, except they have straighter lines and harsher edges. These faucets can come with one or two handles, and they can have different finishes. One of the advantages of using this kind of faucet is that you can install them on almost any kind of sink, and they will look great. The finish is one of the most important features of the faucet. High-quality finishes are easy to maintain, and they won’t get scratched from the regular wear and tear. There are other things you should think about when choosing a finish, though. Aspect – The finish will greatly influence the aspect of the faucet. Most people go straight for the chromed or stainless steel finish, and these are the most popular options nowadays. However, there are some finishes you can use to enhance the design of your bathroom. Oil rubbed bronze – The oil rubbed bronze is a highly fashionable finish. It is usually not even considered by potential customers, but if you buy a sink with a nice design, be it classical or modern, this finish will augment its appearance. Polished brass – Another nice finish most people don’t consider is the polished brass. This finish is not for every faucet, but it can look amazing on some. If you have a large bathroom with a classical design, a faucet with a polished brass finish can make it look very elegant. A finish looks good if it’s clean. If it’s not, the faucet might look bad, making your bathroom look bad in turn. Some finishes are better at revealing the spots than others, so make sure you know how frequently you need to clean the faucet before you choose a finish. Whenever you choose a finish, make sure it will fit all your other fixtures. If your faucet has a brass finish, the shower a chromed one, and the towel hanger one of stainless steel, the aspect of your bathroom will suffer as a whole. If you’re building a new bathroom, make sure the finish you choose for the faucet is available for the other fixtures as well before you order it. Some finishes are easier to find and match than others, so make sure you check their availability for the other fixtures before you buy. The size of the faucet is very important. You have to make sure the faucet size matches that of the sink. As a rule of thumb, the larger the sink, the larger the faucet you will have to buy. You shouldn’t exaggerate though, buying a faucet too large might result in an awkward fit. On the other hand, if the faucet is too small for the sink you’re planning on installing it on, the water spray might end up on the wall of the sink. This might lead to splashes and it will ruin your experience. Now, there are some things you should check before buying a faucet. First of all, you should check the sink to see how many mounting holes it has before deciding on a faucet model. If the sink only has one mounting hole and you buy a faucet needing three mounting holes, you might have to drill the holes yourself. This might not seem like much, but drilling a hole through marble or cast iron is not very easy, so it’s better to just buy a faucet that matches. Second, you should make sure the faucet you buy can be mounted on the sink you have or the one you’re planning to install. Some sinks can be very thick, so you might need some nut extenders so they can reach the supply lines. However, these nut extenders are not difficult to find, and most of them will work on many faucet models, so you can just buy them separately. You might be wondering why this is an important feature for faucets. You only have to install the unit once, so why should it matter? Well, things can sometimes be complicated when you’re trying to install a faucet. Usually, no matter how cheap or expensive they are, faucets can be installed by the owner without professional help and only a little DIY experience. But there are some models out there that have a difficult installation. This installation process might test your nerves, and increase your expenses as well. Using a professional plumber to install your faucet can increase the unit’s overall cost by over $100, or more depending on where you live. This might not seem like a very high expense, but there are hundreds of faucets that can be installed without spending this money, so why should you do it? Usually, when you buy a faucet that’s easy to install, you’re also buying a faucet that’s relatively easier to fix. This might, at some point, be a major advantage. If you’ve been looking for a bathroom faucet, you might have already encountered discussions on this topic. 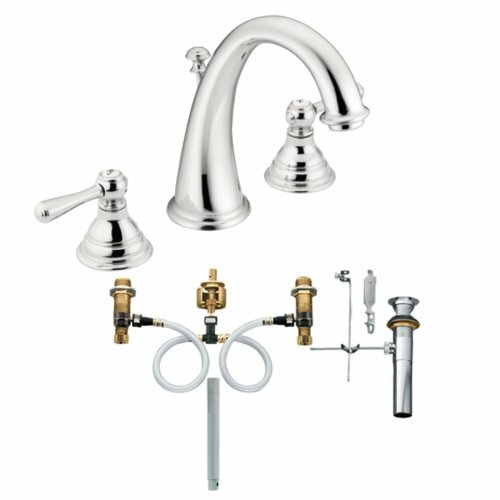 Which is better, a high arc or a low arc bathroom faucet? Well, there is no simple answer to this question. As a matter of fact, the question itself is wrong. In this case, one cannot be better than another, except when you compare how they work when they’re mounted on the same sink. As you can imagine, when you’re using a deep sink, using a high arc faucet increases the distance the water has to fall from until it reaches the bottom of the sink. This might lead to splashes, depending on the sink’s design. If your sink is deep, you might consider choosing a low arc faucet which will direct the water towards the drain faster, minimizing the chances of splashing. On the other hand, if you have a shallow sink and you use a low arc faucet, you might not have enough space to fit your hands properly. It might even be worse. The low arc faucet might direct the water towards the wall of the sink, leading to splashes that might end up on the user. This is a situation you don’t want to encounter, so when you have a shallow sink, you might be better off using a high arc faucet. There are, of course, other things you need to consider. 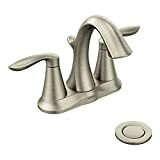 A high arc faucet might get in the way when you bend over to wash your teeth or your face, but they generally look better than low arc models. When you wash your hands under a high arc faucet, you tend to hold your hands above the sink’s rim, so you might splash more water than when you use a low arc model. And the last and probably most important aspect you have to consider is how these models will look when they’re installed on the sink. You might be willing to clean the splashes once in a while if the bathroom will look better. Both the widespread and the centerset models can look great in a bathroom. Some people might argue that the widespread models are usually easier to clean, but that’s not necessarily true. Depending on the finish they have, centerset faucets can also be very easy to clean. The most significant difference between these designs is their aspect. People tend to think widespread faucets are more expensive than their centerset counterparts, so they tend to give them more credit and be more impressed by them. If your goal is to impress people, you should go for a widespread model. You should also take into account the sink’s build. If the sink has only one mounting hole, it will be easier to install a centerset faucet than to drill two additional holes yourself and install a widespread model. Plug the drain- if you don’t have a plug, just use a rag or some towels. Replace the rubber O-rings – after you take out the nut, you will find the stem sitting on top of a rubber ring. This ring is usually the cause of the dripping because it can wear out in time. Reassemble the handles – now repeat the process, but in the reverse order. We’re certain that after reading our bathroom faucet reviews you are now able to determine which is the right model for your home. Keep in mind that it doesn’t matter how cheap or expensive the faucets are. If you want to find the best bathroom faucets, you have to think about which one will fit best in your home. Finding the right model is more about determining which one fits the style and design of your bathroom than it is about looking for special features. Remember that once you choose a finish for your bathroom faucet you will also have to pick the same finish for all your other fixtures as well. Some finishes are easier to find than others, so make sure all the fixtures are available in that finish before you make a purchase. Check out the sink before you decide on a model. You don’t want to drill through marble just so you can install a faucet. If the sink has only one mounting hole, choose a centerset model.